Hip Dysplasia occurs when there is a problem with the joining of the hip bone. The hip joint is a ball and socket and attaches the hind legs to the body of the dog. The ball is the femur head and the socket (acetabulum) is part of the pelvis. For ease of movement, the ball must fit smoothly into the socket. To further strengthen the connection, the two bones are held together by a strong ligament which attaches the head to the socket. Circling the two bones is a very strong band of connective tissue acting as a stablilizer. The socket is smooth and covered with a layer of cartilage. The joint also contains lubricating fluid. In a dog with all these factors working together correctly, the hip is normal. With Hip Dysplasia, the joint develops abnormally and the muscles, ligaments and connective tissue become loose causing the ball and socket to lose contact. The separation is called subluxation. Many dogs, although born with normal hips, can develop Hip Dysplasia at any age although it usually appears later in the dog’s life. Eventually osteoarthritis develops, making any movement painful. Spurs, irregularities, small protrusions, show on the femur head. Signs of Hip Dysplasia can be an abnormal gait, the leg cannot bend fully. After exercise or lying down for a while, the dog has difficulty getting up. Climbing stairs can be a problem. Often the dog will be unable to put pressure on the leg and will begin to limp. Sometimes,in milder cases, the dog’s movement will improve after walking around a bit. Great Danes and St. Bernards appear to have a higher incidence of Hip Dysplasia, but it can occur in smaller breeds as well. Genetics play a major role in a dog developing Hip Dysplasia. 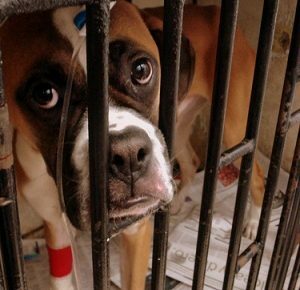 It’s important to check the dog’s family history if possible to make sure there are no carriers of the disease. However, researchers have discovered that puppies fed a rich diet before bones fully develop or dogs that are overweight or over-exercised can become dysplastic. 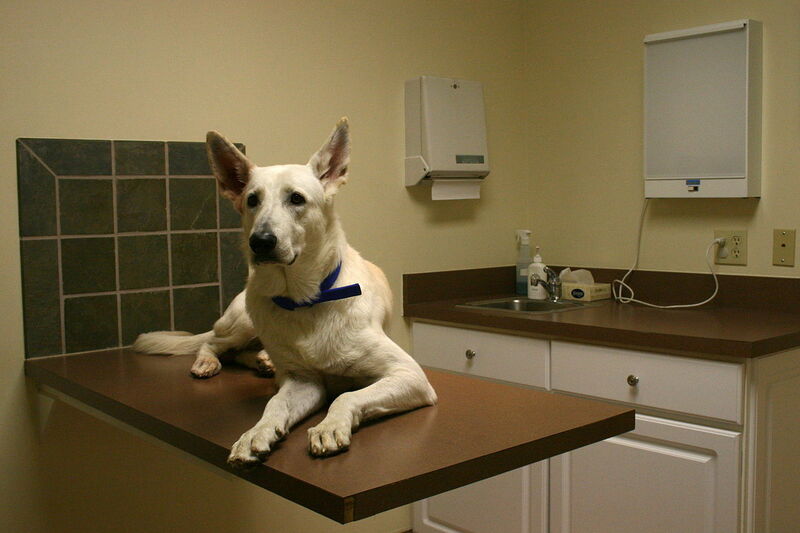 Diagnosis is made through the veterinarian’s manipulation of the legs and through x-rays. Breeders will have their dogs checked for Hip Dysplasia and the dogs will be graded as excellent, good or fair. There are a number of treatments for Hip Dysplasia depending on the dog’s age, size and the severity of the disease. Medications and supplements are available that will give pain relief and sometimes slow the progression of the disease. There are also several types of surgery. TPO – Triple Pelvic Oseotomy – Used in dogs less than 10 months old. The pelvic bones are broken and the femoral head and actabulum are realigned. This surgery is expensive but very successful. Juvenile Pubic Symphysiadeses for dogs between 16-20 weeks old. Two pelvic bones are fused together so that the other pelvic bones develop normally. The angle of the hip is changed improving the connection of the joint. Total Hip Replacement – This surgery is done on a fully mature dog. It involves removal of the joint, replacing it with an artificial one. If both hips need to be replaced, there is a 3 month period between procedures. This is also an expensive surgery, but results are very good. The dog usually resumes normal activity and is pain-free after the recovery period. Femoral Head and Neck Excision – The head of the femur is removed and replaced with a fibrous joint. This a a less expensive surgery and usually works better on dogs that weigh less than 40 lbs., but can be used on larger dogs. After recovery, you dog should have some exercise. Check with your vet for an appropriate regimen. There are orthopedic beds available that provide warmth for your dog during cold or damp weather and provide comfort for sleeping. 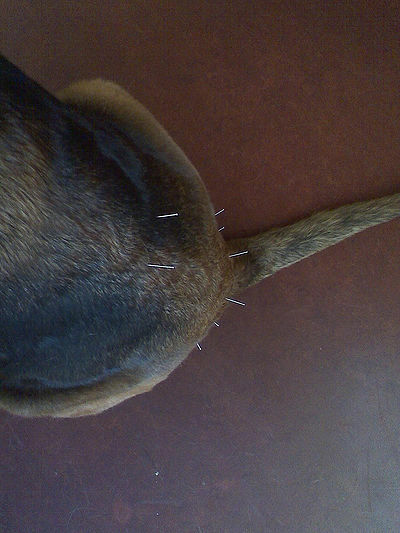 Acupuncture, reiki and massage , performed by veterinary specialists have shown to improve the situation. You can purchase ramps that allow your dog easier access to your car or furniture. There are a number of supplements availbable that help with the management of arthritis. Glucosamine and Chondroitin help rebuild damaged cartilage. MSM (methyl=sulfanyl-methane) is a sulfur compound with anti-inflammatory and pain reducing properties. Omega 3 oils also have anti-inflammatory properties. Duralactin, a product of grass-fed cow’s milk is used for musculoskeletal disorders and as an anti-inflammatory. On a personal note, I have had experience with Femoral Head and Neck Excision and Total Hip Replacement with two of my dogs. The Femoral Head and Neck Excision was performed on my rottweiler mix, Freddie, when she was 2 years old. She began limping and couldn’t put any pressure on her rear leg. After x-raying the site, my vet at the time suggested this surgery. Recuperation went very well and Freddie never had a problem after that. Freddie weighed about 60 lbs. at the time of surgery. My German Shepherd Quanah began limping off and on when she was about 3 years old. My vet and the surgeon kept a close watch on her during this time. When the pain was obvious, she was treated with medication. She has been on a glucosamine/chondroitin supplement for several years. Two and a half years ago at the age of 5, we decided since there was no improvement and the arthritis would continue to worsen, that hip replacement was the answer. Quanah weighs 110 lbs., so she is a large shepherd. Although she developed a severe bacterial infection after the surgery, she recovered well and since, has no problems with either hip. Unfortunately, she has knee problems as well and recently, after a bout of tick fever, had TTA cruciate ligament surgery and if that wasn’t enough, it was followed shortly by an emergency splenctomy. Almost 4 years ago, Quanah also suffered stomach torsion (bloat) and had emergency surgery. Thanks to her excellent veterinary care and constant vigilance, she is doing very well now.